"Electrical kettle", which provides boiling water in just over a minute when one needs it and comes in handy during tea time and meal, is convenient and a popular product genre. However, most of them have cute round shapes or fancy designs, and there were just a handful of products with styles close to a "standard pot" with interesting designs. It can also be said that there were many cases where the basic design was done overseas. 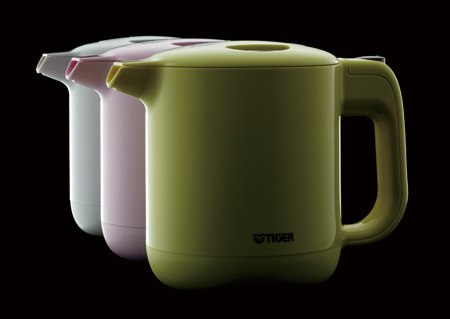 Under these circumstances, the desire of Tiger Corporation to make something "made in Japan" from the point of view of safety, comfort, and ease of usage has led to the birth of "electric kettle PFY-60". As a predecessor, a longer and larger PFV type was released, and the product was a hit. In creating PFY type, the second generation, there was a great debate on whether to keep the design similar or to change the style and attempt to widen the user range. In the end, the basic design was kept, and market was enlarged by varying the size and improving the functionality. This episode shows the awareness of the company to not desire for "a ball thrown for a change of pace", but continue producing with "a strong ideology". The beautiful combination between the design and the thoughtfulness towards ease of usage and safe design, such as the structure that prevents water from spilling when the kettle is turned over and the lid with a wide opening that can be attached and taken off with just a touch, was born in a similar way.